Patio Flooring Ideas... Want Something Different? I spent most of the past weekend looking for just the right patio flooring ideas for a patio I’m currently working on. If you have also been searching for just the right patio flooring ideas, you know exactly how daunting a task this can be, especially if you’re trying to stay within a certain budget. In my case, there is a very tight budget for the patio I’m building. After looking at patio flooring ideas such as expensive natural stone and rock, some of which is truly amazing, I decided to go with an affordable manufactured concrete paver. Now don’t get me wrong, these aren’t the boring old red or gray concrete block pavers of the past. The pavers I picked out for my patio floor are about eight inches square and are dyed and tumbled to give them a rugged and varied distressed look, much like natural stones have. 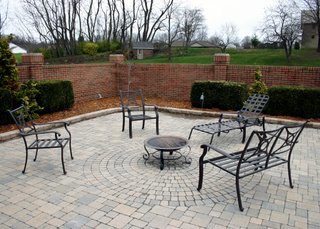 Patio pavers can also be found to resemble antique cobblestones or street bricks. Of course, it’s probably easier all together just to pour a regular concrete patio instead of installing these pavers one at a time. With dyes and stamping, you can achieve the same effect. But, unless you are a concrete professional, it’s not exactly a do it yourself project. Try building a traditional deck, but lower to the ground to get more of a patio feel. Do make sure to keep the wood or man made decking material far enough elevated so it doesn’t take on ground water, dirt or weeds. 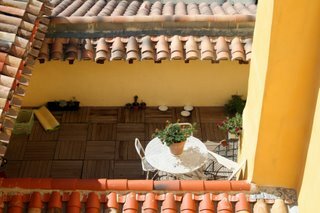 Tiles for a patio flooring idea are somewhat uncommon, but using the right kind of tile installed properly in the right climate zone, this could be a really cool option. I’m certainly not a tile expert, but common sense says this could end up being quite an expensive project. Also watch out for the freeze-thaw cycle if it applies to your area… it could really wreak havoc on a tiled patio. If you’re searching for more temporary or portable patio flooring ideas, check out outdoor patio mats. They come in all kinds of appealing designs, colors and sizes, usually made of a woven resin material. Plus you can take them with you camping, to the beach, or wherever else you may go. These pre made wood or manufactured decking material tiles are a really neat patio flooring solution. They look fantastic and are fairly easy to install. Just place them right over your old concrete patio or another solid surface and snap them together. Of course a traditional granite patio floor would be wonderful, but there is a great deal of expense that goes along with it. If you’d like to have the look of granite, but on a slim budget, find broken or salvaged granite pieces. Arrange the pieces together as you would with any natural stones. You’d be surprised how easy it can be to find salvaged granite. Hopefully, one of these patio floor ideas will suit your needs. Don’t be afraid to use whatever material you most prefer, whether it is concrete or salvaged granite. With a little creativity, you can easily come up with all kinds of great patio flooring ideas!